Huizhou Cell Valley New Energy Technology Co., Ltd. is an innovative high-tech enterprise.The company was incorporated in April 2107. It is located in Zhongkai High-tech Zone, Huizhou. We focus on new technologies for lithium ion batteries and industrialization of agel semi-solid lithium ion batteries and sales of semi-solid lithium ion batteries. Under the leadership of the core leadership, the company continues to expand and innovate. At the same time, the company has achieved breakthroughs one after another. At present, the company has formed a management team composed of professors, doctors and MBA members.These core members have deep professional foundation and rich industry experience. The company has 1,200 square meters of factory buildings and has industry leading production lines.For our independently developed ultra-thin semi-solid lithium ionbatteries and ultra-high temperature semi-solid lithium ion batteries, the company can not only fully accept customer customization，and has successfully achieved mass production. At present, the company already has 600,000pcs/month of production capacity. (1) Ultra-high temperature semi-solid lithium ion battery: It is mainly used in automotive electronic equipment, standby power supply for industrial equipment, etc. 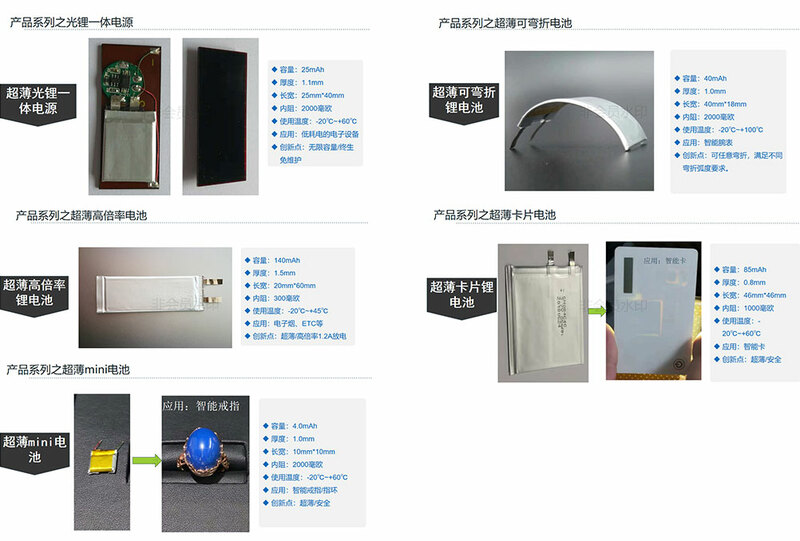 (2) Ultra-thin semi-solid lithium ion battery: it is mainly used in logistics tracker, smart bank card, etc. Our semi-solid lithium ion batteries have many significant advantages over traditional liquid-state lithium ion batteries:They have the advantages of higher safety, longer life, and faster charging and faster discharging, and many more. Also, semi-solid lithium ion batteries are more simplified and more efficient than traditional liquid-state lithium ion batteries in terms of manufacturing processes, resulting in better cost advantages. We warmly welcome new friends and old friends from various industries to visit Cell Valley in Huizhou to exchange ideas and discuss cooperation.